Let us continue from previous post, where we studied about multiplexing of VC-12 into VC-4. In this post, you will read about VC-4 Path overhead and Mapping of VC-4 into STM-1 frame. The VC-4 Path Overhead forms the start of the VC-4 payload area and consists of one whole column of nine bytes as shown below. The POH contains control and status messages (similar to the V5 byte) at the higher order. 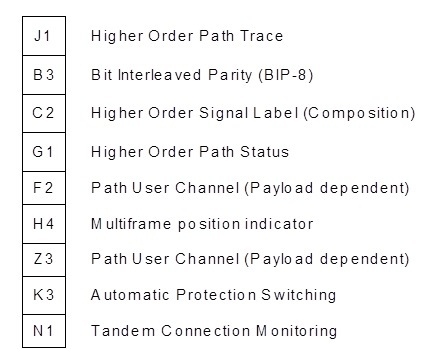 J1 - Higher Order Path trace. This byte is used to provide a fixed length user configurable string, which can be used to verify the connectivity of 140 Mbit/s connections. B3 - Bit Interleaved Parity Check (BIP-8). This byte provides an error monitoring function for the VC-4 payload. Mapping of a VC-4 into an STM-1 frame. An AU pointer is added to the VC-4 to form an AU-4 or Administrative Unit -4. 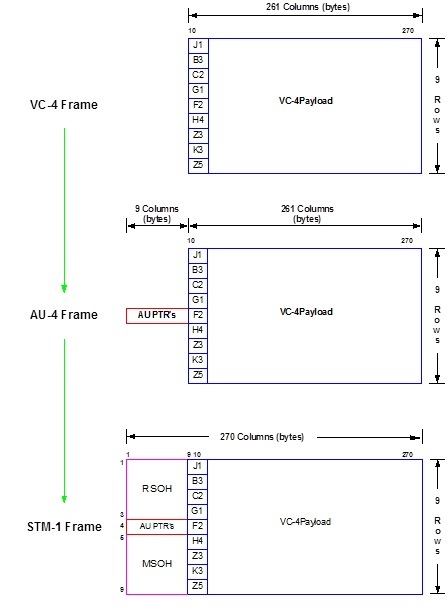 The AU pointers are in a fixed position within the STM-1 frame and are used to show the location of the first byte of the VC-4 POH. The AU-4 is then mapped directly into an AUG or Administrative Unit Group, which then has the Section Overheads or SOH, added to it. These section overheads provide STM-1 framing, section performance monitoring and other maintenance functions pertaining to the section path. The VC-4 payload, plus AU pointers and Section Overheads, together form the complete STM-1 transport frame.